The main concept of the proposed system is nut fitting & removing without human help for driving. The heart of the project is motor.. The components used here for efficient function of individual blocks are Motor, Nut fitting arrangement (spanner) and spur gear arrangement. The project has to give the positive & negative potential to the motor. 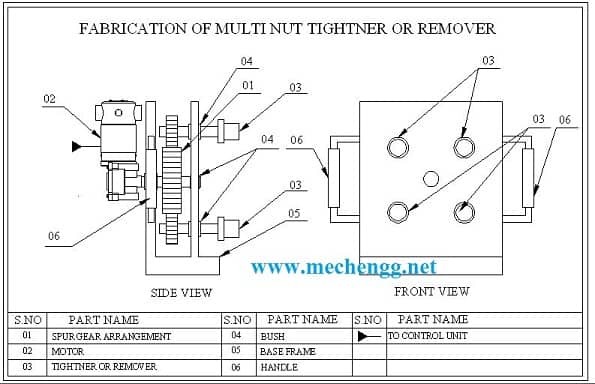 If we push the corresponding switch for forward rotation, it helps to fix the nut, or else if we push the corresponding switch for reverse rotation, the given polarity will be changed oppositely and it helps to remove the nut. The motor can be operated according to the operator’s requirement. The electric power can be given by the battery. The operator should lift the model and place at the appropriate place to tighten or remove the nut. A housing has three sockets extending beyond the front face thereof, spaced to simultaneously engage the lug nuts securing a wheel to a vehicle. Each socket has secured to a peripheral portion a satellite gear that engages a universal gear. The universal gear has a drive surface allowing it to be driven in a conventionally opposite direction to simultaneously remove the lug nuts and then driven in the opposite rotational direction by a pneumatic wrench to simultaneously secure the lug nuts securing the replacement wheel to the vehicle, greatly reducing the time needed for a wheel/tire change. This tool has the potential for greatly reducing the time required for a pit stop in stock car racing giving a huge advantage to the team so equipped. The present invention is directed to a tool that enables all lug nuts holding a wheel to an axle to be simultaneously removed. In stock car racing, the automobile may not be significantly modified from the “off the floor” condition which is sold in show rooms. So unlike the Indy car where a single nut can be used for attachment, the wheels must be attached with all lug nuts (sometimes 4 or more typically, 5). Accordingly, in racing stock cars, the removal and replacement of the wheels become a key rate-determinative factor in completion of a pit stop. One way pit crews attempt to reduce the turn around time is to cement the lug nuts to the replacement wheel to eliminate handling the lug nuts during replacement. In addition, ¼″ to ½″ of the threads are ground off the lead end of the studs so that the cemented lugs can seat on the stud and not simply be knocked loose as the replacement wheel is mounted. Still, in an industry where winning and losing can be determined by tenths of a second spent in the pit, it would be of significant benefit to be able to remove multiple lug nuts, preferably, all five, at the same time. A racing team which had such a tool might save 2-4 seconds each pit stop, a tremendous advantage in an arena where races are frequently decided by tenths of a second. The present invention provides such a removal tool enabling all five lug nuts to be simultaneously removed. The tools comprises multiple individual socket assemblies for simultaneously engaging each lug nut that attaches a wheel to a vehicle, each socket including a nut-engaging socket and a satellite gear attached to each of said individual nut-engaging sockets for rotationally driving said individual nut-engaging socket in both rotational directions; a universal drive gear engaging each of said satellite gears for simultaneously rotating all of said individual socket assemblies in either of said rotational directions; a housing including an inner plate, an outer plate and a peripheral wall extending between said inner plate and said outer plate, said housing encasing said satellite gears and said universal gear; a drive surface attached to said universal drive gear; whereby a pneumatic wrench may engage said drive surface and simultaneously remove and replace all lug nuts securing the wheel. Various changes, alternatives and modifications will become apparent to one of ordinary skill in the art following a reading of the foregoing specification. For example, each of the sockets 30 could be magnetized to retain the lug nuts therein, obviating the need to glue the lug nuts to the rims on the replacement wheels. It is intended that any such changes, alternatives and modifications as fall within the scope of the appended clams be considered part of the present invention. whereby a pneumatic wrench engages said drive surface and, by rotating said drive surface in a direction opposite to a desired drive direction for said socket assemblies, simultaneously remove and replace all lug nuts securing the wheel. 2. The multiple lug nut removal tool of claim 1 wherein each of said individual socket assemblies farther comprises a locator pin extending from said opposite end of said individual nut-engaging socket said locator pin being received in an aperture in said outer plate of said housing. 3. The multiple lug nut removal tool of claim 1 wherein a number of lug nuts attaching the wheel to the wheel comprises five and said number of individual socket assemblies comprises five equally space about a pentameter portion of said housing, said housing being shaped as a pentagon to accommodate said five equally spaced socket assemblies. 4. The multiple lug nut removal tool of claim 1 further comprising a handle secured to said outer plate at two points to facilitate manipulation of said multiple lug nut removal tool during use. 5. The multiple lug nut removal tool of claim 1 wherein each individual nut-engaging socket is equipped with an internal 12 point recess for facilitating engagement of the nut. 6. The multiple lug nut removal tool of claim 1 wherein said drive surface comprises a recess for engagement by an extender secured to a pneumatic wrench. 8. The multiple lug nut removal tool for use in NASCAR racing of claim 7 wherein each of said individual socket assemblies further comprises a locator pin extending from said opposite end of said individual nut-engaging socket, said locator pin being received in an aperture in said outer plate of said housing. 9. The multiple lug nut removal tool for use in NASCAR racing of claim 7 further comprising a handle secured to said outer plate at two points to facilitate manipulation of said multiple lug nut removal tool during use. • It is difficult to remove if rust is formed since it requires high torque to remove nut. • It is applicable in automobile workshops.